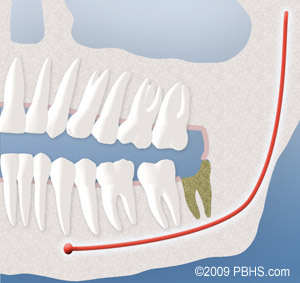 In most cases, the removal of wisdom teeth is performed under IV sedation. Anesthetic options, as well as the surgical risks will be discussed with you at the initial consultation. Once the teeth are removed at the time of surgery, the soft tissue is sutured to increase post-operative healing and decrease pain. To control bleeding, patients should bite down on the gauze for approximately 2 hours after the completion of the procedure. Patients will rest under our supervision in the office until ready to be taken home. Upon discharge, the care package will include postoperative instructions, prescriptions for pain medication, antibiotics, and a follow-up appointment if necessary. If you have any questions, please do not hesitate to call the office at Phoenix Office Phone Number (623) 518-2325. 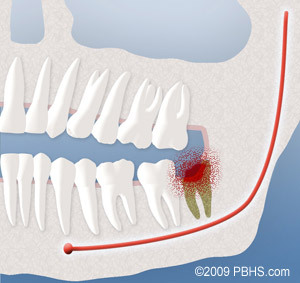 On the first day after third molar extractions, you may experience some minor bleeding and pain. Each individual’s reaction to surgery varies, and the sensation of pain can range from mild discomfort to severe pain. A variable amount of swelling can be expected following the surgery. This swelling usually peaks on the second or third day and should begin resolving on the fourth day. You can limit the amount of swelling by applying ice to the affected areas for 24-48 hrs after surgery. Please remember to put ice on the first day even if it is somewhat uncomfortable to have the cold next to your skin. On the third day, you may notice that your jaw muscles are stiff, and it is difficult to open your mouth (trismus). You can apply moist heat to your face on the fourth or fifth day allowing your muscles to relax more and open wider. Most of the time you will want to limit your activities for approximately 1 week. We ask that you follow your post-operative instructions closely. Doing so will make you as comfortable as possible during the first few days following your procedure. Please allow time for your body to begin healing before resuming an active social, academic, or athletic schedule. Most patients feel like they are over the hump and on their way to recovery in 3-5 days. As with any surgical procedure, there can be complications or unexpected results. These can include delayed healing, infection, dry socket, sinus communication, and post-operative numbness or tingling in your gums, lips, cheek, chin, or tongue due to nerve damage. Dr. Pierse will review all the possible complications with you at the initial consultation. A primary concern is the nerve within the lower jaw bone that supplies feeling to the lower lip, teeth, chin, and tongue. This nerve is frequently very close to the roots of the lower wisdom teeth. Having these teeth out between the ages of 12 and 18 usually provides shorter roots so that the nerve is not so close to the roots of these teeth. Occasionally, when the teeth are removed, and especially in older patients, the nerve can become injured. When local anesthesia wears off, you may experience a tingling or numbing sensation in the gums, lower lip, chin, or tongue. Should this occur, it is usually temporary and will resolve gradually over a period of weeks or months. On rare occasions it can result in a permanent alteration of sensation similar to having local anesthesia. The upper wisdom teeth are situated close to your sinuses, and their removal can result in an opening between your mouth and the sinus. Once again, if the teeth are removed at an early age, the root formation is minimal, and this complication is very unlikely. However, if it does occur, it will usually close spontaneously, but we may give you special instructions to follow for approximately 4-6 weeks from the day of surgery. Pressure should not be created in the sinus area, which may dislodge the healing blood clot. If you sense this condition occurring after the surgery, please contact the office. An additional procedure may RARELY be necessary to close the opening. Dry sockets continue to be the most common problem people experience following oral surgery. They arise due to premature loss of the blood clot in the empty tooth socket. This seems to occur with greater frequency in people who smoke or are taking birth control pills. 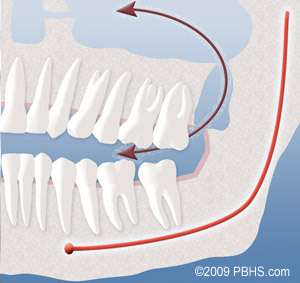 While both jaws can be affected, they usually occur in the lower jaw on the third to fifth day. They usually cause a deep, dull, continuous aching on the affected side(s). Patients may first notice the pain starting in the ear radiating down towards the chin. The symptoms frequently begin in the middle of the night, and the pain medication regimen may not help. Treatment can involve changing your prescription. Occasionally, it is helpful to place a medicated dressing in the empty socket. This will help decrease the pain and protect the socket from food particles allowing the site to heal. The effectiveness in alleviating the pain lasts for 24-48 hours and may require dressing changes at the office every 2 to 3 days for a week to ten days. Dressings usually are removed when you have been pain free for about 2 to 3 days. The dressing does not aid in the healing process. The only reason to place a dressing is for pain control. If medication is controlling the pain, the socket should heal without a dressing. Following removal of the dressing, an irrigation device may be provided to help you keep food particles from lodging in the extraction site. Occasionally, post-operative infections occur. This usually requires an office visit and clinical examination. Many times, just placing you on an antibiotic for an additional 7-10 days will resolve the infection. If it persists, the area will have to be drained and cleaned. 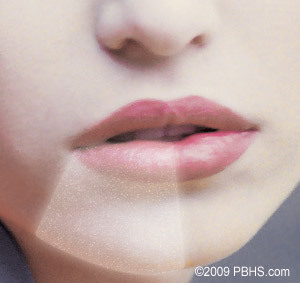 Other problems in the post-operative period include stiffness of the jaws (trismus), chafing around the corners of your lips, facial bruising, and oozing from the extraction sites. The post-operative instructions will address most of these issues. If you have any questions or issues during the recovery process, please feel free to contact the office at Phoenix Office Phone Number (623) 518-2325.